Karl reMarks: Urban Farming: The future of food or Arcadia on the cheap? Urban Farming: The future of food or Arcadia on the cheap? In a thought-provoking article in The Global Urbanist, the urban designer Mike Duff discusses How cities can embrace urban agriculture and weaken the grip of 'big food'. The issue of urban farming has been attracting much attention recently and Duff makes an appealing argument in favour of this form of agriculture. Duff realizes that the main limitation to the growth of urban agriculture from a marginal activity into a significant source of food is its limited scale and therefore urges the loosening of regulation to allow the development of larger, more efficient urban farms capable of competing with large supermarkets. But portraying this important discussion as a David versus Goliath confrontation reveals the romanticised view of the world that drives support for urban farming today. This is no longer a discussion about cities or food but another symptom of our discontent with modernity. A few months ago, the BBC screened the sublime film Requiem for Detroit? which powerfully captured the decline of the city from a major industrial centre into a post-industrial wasteland. The film provided a snapshot of the extent of land reclaimed by ‘nature’, a staggering area of 40sq miles out of the 139sq mile inner city. Since the national supermarket chains had long abandoned the inner city, thereby cutting off the supply of fresh produce, the locals turned to farming thus sparking off a large-scale movement. The availability of land naturally facilitated this process. Duff neatly sums up the issues facing Detroit as a result of the proliferation of urban agriculture. The question of regulation is an important one; the boundaries of what urban farming is are yet to be determined. Loss of taxation and revenue as a result of land reclassification is also a concern for city authorities. And lastly, the low land prices have attracted commercial interests aiming to profit from large scale urban farming operations. This of course has sparked some tensions with the purists among the community farming advocates. Duff proposes the creation of a hybrid land use designation called 'urban agricultural uses' to overcome some of the emerging challenges and encourage the further expansion of urban farming. He’s looking beyond Detroit however and suggests that all cities should embrace this trend. In his view, it’s a ‘powerful tool to get urbanites engaged in shaping their cities’. But his failure to recognize the uniqueness of Detroit’s situation is very revealing of the mindset that drives the enthusiasm for urban farming. The residents of Detroit opted for this solution out of necessity not by choice. ‘Engagement in shaping their city’ is a very glamorous way of describing the retreat to subsistence in one of the largest cities in the US. I don’t wish to come across as an opponent of urban farming, it’s definitely an enjoyable middle-class pursuit, but so is swinging for people who like it. As far as I know, no one’s proposing that as a way to encourage citizens to engage in ‘shaping their cities’. Outside of Detroit, not many cities are sitting on large tracts of urban land that is available for urban agriculture. In fact, cities place a premium on land and allocate uses based on value as defined both socially and economically. Given that most developed countries have been consistently reducing the amount of land dedicated for agriculture, it is hard to justify losing valuable urban space to promote urban farming. In a city like London for example, where both Mr. Duff and I live, there is a short supply of land available for residential developments leaving many people in inadequate accommodation. There’s certainly no benefit to introducing further competition for valuable land in pursuit of an agrarian fantasy. Much of the problem with the urban farming debate stems from the inability to understand the complexity of modern food supply systems and the failure to appreciate the benefits of intensive farming. For example, Duff suggests that it is possible for urban farms to compete with supermarkets because of the savings made in transporting the food. This chimes very well with the local food movement that also promotes the environmental advantages of locally produced food. But as Carnegie Mellon researchers Christopher L. Weber and H. Scott Matthews have shown, transportation represents only 11% of food emissions, with delivery from producer to retailer responsible for only 4%. In fact, 80% of food emissions are generated in the production phase. The reason of course is down to the efficiency of intensive farming. A similar logic applies to cost, that is why farmers abroad can produce food cheaper than it costs local suppliers. In fact, the only way for urban agriculture in developed countries to achieve a significant level of production is through the introduction of subsidies. Even land use designation in urban areas is ultimately a form of subsidy. City authorities will have to offset the loss of earnings as a result of this designation with some services suffering consequently. Needless to say, the EU and the US already subsidize their agricultural sectors heavily, at the expense of farmers in the developing countries. Even with these subsidies in place, most European countries are seeing more and more land being withdrawn from agricultural use annually as production abroad continues to become more economical. The introduction of further subsidies in Western countries will ultimately hurt African farmers and increase real food costs in the West. Duff contends that urban farming has a number of ‘economic, aesthetic, social, educational, health and open-space related benefits’. I find this argument very curious, much like with cycling people are no longer capable of enjoying things for themselves, there has to be a host of benefits that could be quantified and assessed. The economic and social benefits are questionable to say the least, in fact some of the arguments I made above show that they would be disadvantageous. The aesthetic and educational benefits are subjective and are in any case satisfied through current arrangements like allotments and gardens. In terms of open space, urban farms actually compete with parks for space, and parks are definitely more valuable for city dwellers. Lastly, on health benefits, an urban farm must be the most expensive way of clearing a headache there is. All of the above hypothetical benefits are however secondary to what seems to be Duff’s central point: the development of urban agriculture should be seen as a means to counter the influence of ‘big food’, the large supermarket chains and multinationals that supply most of the food in the West. This is not proposed in radical terms however, for Duff understands that ‘big food’ has a role to play in a ‘sustainable food system’. There are several popular contemporary ideas that propose tinkering with capitalism rather than overthrowing the system in favour of a fairer and more dynamic system. Duff’s vision of the role of urban agriculture follows a similar pattern. It’s worth dwelling on the reasons for this antagonism to big business, and why it’s singled out for critique as if it were independent from the general development of capitalism. Duff argues that ‘...we are grateful to 'big shed' food retailers for feeding us, and are therefore somewhat comfortable with the likes of Tesco, for example, having the largest property portfolio in the United Kingdom, capable of holding city planning authorities to ransom’. It’s very interesting to observe that in the context of discussing agriculture Duff would focus on Tesco’s property portfolio which is indeed the largest but in value. However, if we look at land ownership by size a different picture emerges. The largest three estates in the UK are owned by the duchies of Cornwall and Lancaster and the Duke of Cornwall. In fact, a third of all land in the UK is still owned by the aristocracy and traditional land gentry. Furthermore, the largest landowners still receive a big share of EU farming subsidies, with the Queen, Prince Charles and the Duke of Westminster among the recipients. The rest of the population is squashed into a small part of the country with no proper access to land: despite all the claims about the disappearing countryside only 9% of the area of the UK is urban. Compared to the large estates monopolising land in the UK, Tesco looks positively progressive! Is Tesco ‘holding city planning authorities to ransom’? Not the way the UK planning system works. In fact, because of a combination of the specific requirements of the planning system and the state’s reluctance to provide any housing directly, Tesco has ended up as a major housing provider in the country. So in fact, many local councils rely on the likes of Tesco to meet their affordable housing requirements. Of course this is not an ideal situation, but it seems very strange in this context to protect the interests of large landowners and design an agricultural policy that targets some of the bodies that are actually providing houses and employment. Viewed in historic terms, this seems like an aristocratic attack on the bourgeoisie. Think I’m joking? Prince Charles is a big fan of urban agriculture, with good reason. He has large estates that he has every interest in keeping out of the reach of the masses. Naturally the attempts to deal with such complex issues outside of their historical context are very problematic. 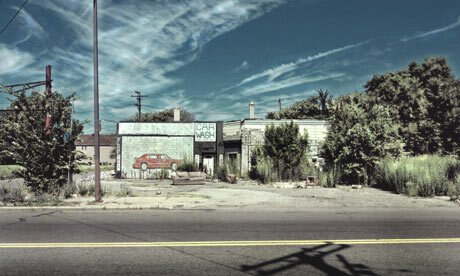 Detroit’s plight for instance is that of rapid deindustrialisation and the lack of vision among American politicians who stood by and allowed the city to decline. But here precisely lies the historical paradox: replacing the industrial engine of the city’s economy with small-scale conventional farming is a step back in time. But industry has fallen out of favour in recent decades, and there’s very little appreciation of the value of industrialisation and the benefits of the prosperity that it brought about. Julien Temple, the director of Requiem for Detroit?, criticized ‘the greed-fuelled willingness of the auto barons to siphon up black workers from the American south to man their Metropolis-like assembly lines’. This is precisely the kind of comment that you would expect from an ignoramus with a simplistic understanding of history. In his seminal work Capitalism and Slavery, Eric Williams analysed thoroughly the role that economic factors played in the movement towards the abolition of slavery. Williams’ work complemented Karl Marx’s thesis that capitalism in its later stages had created the conditions for the abolition of slavery. Of course abolition meant that the freed slaves in the American South had been promoted to the ranks of the proletariat to be welcomed into a different form of exploitation, but nevertheless this was a significantly improved position. Industry was responsible for absorbing the freed slaves and their descendants among the ranks of the urban proletariat, a development that would create the conditions for the civil rights movement decades later and another step towards further emancipation. In this light, Temple’s naivety seems astonishing. Had the black workers not been recruited into the industrial workforce, they would have been consigned to a subsistence existence as agricultural labourers in the South, and crucially denied the possibilities to organise themselves and push for more political rights. Of course the ‘auto barons’ did not recruit them out of the goodness of their hearts, but what capitalist ever did? Temple’s comment however reveals the inability to appreciate the progressive potential of capitalism. Not only was it far superior to the systems that had come before, but it also unleashed a huge potential that all of humanity would benefit from. This is the point that Karl Marx drew our attention to: capitalism has showed what is possible, but it still had its limitations and inbuilt injustices. In other words, Karl Marx wanted to go further than capitalism had gone in liberating humanity and allowing it to fulfil its potential. Instead, we are today offered visions of the future in which the industrial genie is placed firmly back in the bottle while arcadia is reintroduced. Urban agriculture is but one of a multitude of fashionable trends that ultimately mean accepting lower standards of life and squandering the benefits that industry brings about. Seen in the context of Detroit, even the acceptance of urban farms as anything but emergency measures means relegating its citizens to a lower status. It means that they have to accept the consequences of the neglect that the political classes are responsible for and get used to providing for themselves under the most basic of conditions. This is exactly the sort of defeatist attitude that suggested that New Orleans be abandoned after Katrina. But in both cases this would have meant absolving the political classes of any responsibility and learning to live with diminished expectations. I like to think that the solution to Detroit’s problems is not to be founded in gardening manuals but in bolder political visions. A measure of how successful this will be is when the residents of Detroit are planting their gardens for fun not out of need.